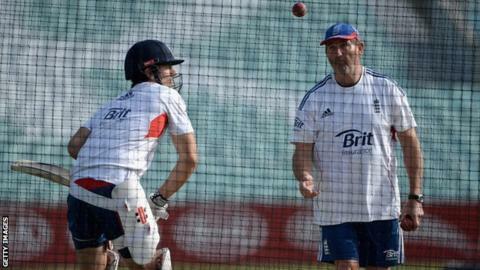 Graham Gooch has left his role as England batting coach, the England and Wales Cricket Board has announced. The decision was made following talks with captain Alastair Cook and new head coach Peter Moores. Former England captain Gooch, who joined the coaching set-up in 2009, said: "Alastair informed me that he was in favour of change. "Although this was sad news, I respect his, and new coach Peter Moores', right to implement this change of direction." Gooch, England's record run-scorer in Tests with 8,900 in 118 matches, steps down ahead of Moores' first game in charge, which is a one-day international against Scotland on 9 May. Cook, 29, paid tribute to Gooch, saying that he had worked with him since he was 17 and remembers when he queued up to get his autograph when he was a child. He told BBC Sport: "To be the guy who rang him up to tell him we're looking to freshen up the coaching staff was incredibly tough for me personally. He's a great man. "But we have made the decision which we think will benefit the England cricket team. There has to be some freshening up - otherwise you get stuck in the past." Gooch said: "Alastair is the right man to captain England; he commands respect and will always put his body on the line for his country. "He will face many challenges and have many more tough decisions to make before his journey ends." Speaking to BBC Radio 5 live, Gooch said his relationship with Cook would not be harmed by the decision, adding: "We will still be friends forever and I hope to still be involved with his game in some way. I will be supporting him. "I hope in the future I'll be able to maintain some of the relationships with the players, so I can try and help them take their game forward. It's my understanding that there might be an opportunity to do that." Gooch's departure is the latest change to the England management structure after a winter that saw them whitewashed 5-0 in the Ashes in Australia. Moores took over following Andy Flower's resignation as team director, Paul Downton replaced Hugh Morris as managing director, James Whitaker took over from Geoff Miller as national selector, and Angus Fraser and Mick Newell joined the selection panel. Downton said: "Graham's record as a player speaks for itself, but as a coach his ability to mentor and develop players has helped England achieve a huge amount in recent years. "In the past few years, Graham has developed exceptional and successful professional relationships with several England batsmen which I will encourage him to maintain." Gooch made a made a pair of ducks on his Test debut in 1975 but went on to captain England in 34 Tests during a 20-year international career. He scored 44,846 runs at an average of 49 in first-class cricket. After retiring as a player, Gooch worked as head coach of Essex in 2001, stepping down in 2005 but continuing as a specialist batting coach. In 2009, he became England's part-time batting coach before taking up the role full-time three years later.